Pinstripe Investigations, Inc. is a full service Melbourne private investigator agency providing investigation services to the entire state of Florida. We are a full service agency and we offer all of our clients a free consultation to discuss how our services may be beneficial to you. All of our investigators are able to cover any assignment at any time of the day. Our Melbourne private investigators are able to cover the entire state of Florida and can accommodate investigations in any city of Florida at an affordable cost. Pinstripe Investigation, Inc. is owned and operated by John J. Aiani, a licensed, bonded and insured private investigator. 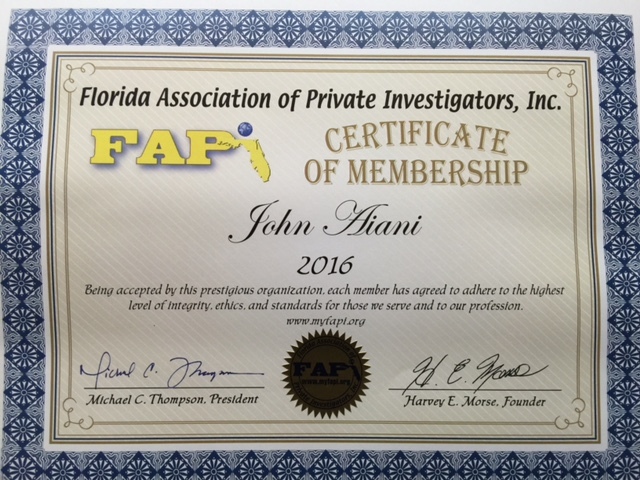 John has been working in the insurance and private investigation business since 1985. He graduated from Pace University in New York City with a BBA in Management Information Systems. His dedication to providing the highest quality customer service is the cornerstone of his agency. Our staff of professional licensed investigators have extensive insurance and law enforcement experience with over 35 years of dedicated investigative services. Pinstripe Investigations main office is located in Melbourne, Florida. This central location allows us easy access to Orlando, Tampa, Jacksonville, Miami and all cities in between. Our rates are competitive, with no hidden fees and can be provided upon request.